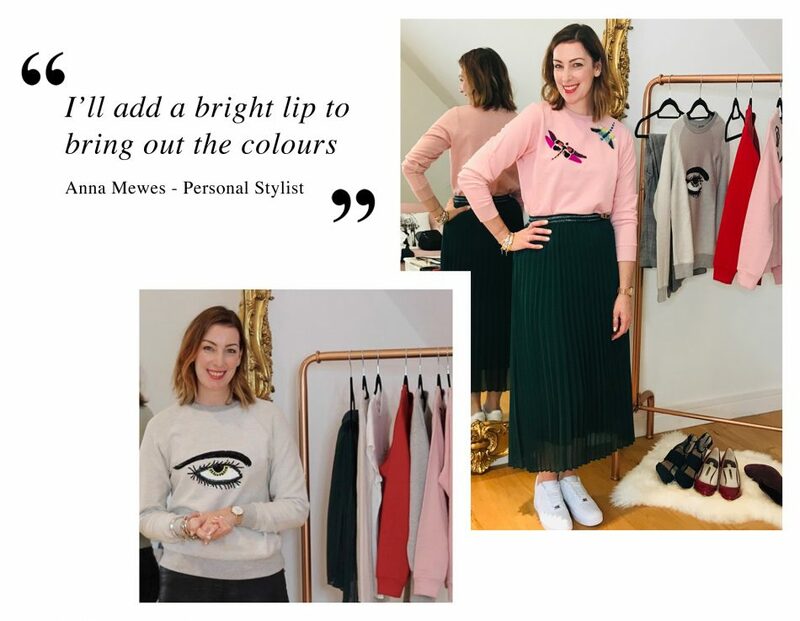 We were thrilled when Personal Stylist Anna Mewes agreed to share her styling tips for our sequin embellished sweatshirts. With a background in fashion marketing, Anna became a personal stylist after overcoming her own personal style issues following the arrival of her two children, her new lifestyle and budget. We love her style and her belief that all women should be able to feel fabulous so we caught up with her to learn a little more about her journey as a personal stylist and to get a few tips on how to style some of our most sparkly pieces!! Following the arrival of my two children it was a very slow process to get my style and self-confidence back on track and the experience has made me passionate about helping women in similar situations rediscover all the things that make them look and feel fabulous. I see women from all walks of life for lots of different reasons but they ALL want to FEEL fabulous – and this is where I come in. I’m passionate about helping women dress in a way that makes them FEEL amazing. We all deserve to sparkle, to feel fabulous and sassy. Midi skirts have been around for several seasons now and they’re back again for Autumn/Winter 2018. I love to dress mine down for the daytime and have mixed this stunning pink sweater with my green midi for an elegant, easy daytime look – the trainers mean I can run around the shops for my clients but I’d also wear shoe boots with this look to dress it up a bit. For a mid-week dinner with the girls I want an outfit that is comfortable but stylish. This ‘Loving Life’ sweatshirt gives a gorgeous pop of colour and subtle sparkle that looks great contrasted with coated skinnies. Finishing touches like co-ordinating the colours in my accessories pull the whole look together. Checks are BIG news this season and I love them on trousers and blazers. This look gives my wide-leg check trousers a more casual feel which I love for a day of meetings and seeing clients at the studio. I’m a Mum on the run most days and I’m always on the look-out for easy outfit combinations that are comfortable but still look stylish. The embroidery on this sweatshirt gives a little sparkle which means no other accessories are needed. My skinny jeans and trainers are staples in my wardrobe and this sweater just elevates them beautifully. Click on the link below to watch Anna’s exclusive styling video as she shares her styling tips for our stunning sequinned sweatshirts.